Hi, it’s good to be back with my Autumn / Winter blog with a delicious recipe to keep fuller for longer. Vegetables for bone broth, straight from the garden from my little helper. It sure is getting a little cold and wet out there and the nippy days can often leave us reaching for excessive ‘simple’ carbohydrates. These types of carbohydrates as most of us are aware don’t help when it comes to keeping off those unwanted pounds or warding off infections like the common cold. So instead of feeling under the weather, I’ve got a delicious comforting seasonal bone broth recipe for you to try out to help keep you in tip top health through the chillier months ahead. Soup making is a great way to get a variety of vegetables into your diet, which in turn increases your intake of vitamins, minerals and antioxidants. It is also a good way of using up leftover vegetables and not to forget, soup freezes well for those days when you have little or no time to cook ! At this time of year I do become a little obsessed with soup-making, particularly with homemade bone broth. It’s nourishing health benefits provide valuable minerals such as calcium, magnesium and phosphorus which together perform a variety of health functions. 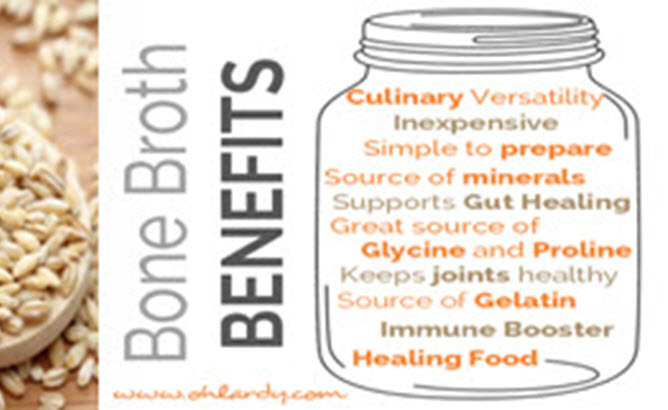 Bone broth is made from the bones of either meat, chicken or fish. A generous dash of apple cider vinegar draws out the goodness of minerals and collagen from the bones to support the health of the gut lining. A healthy gut is important for the immune system and for keeping inflammation in check. The nutritional benefit of adding just a few extra vegetables, ‘good grains’, herbs and spices will result in a tasty and comforting soup to keep fuller for longer and satisfied. I’ve been preparing the bone broth in different ways to help keep a touch of diversity and satiety. I like to add a good handful of barley to my bone broth due to the high fibre content – this helps blood glucose management and is therefore effective in reducing appetite and maintaining energy levels. Wild rice is another ‘good’ grain. It contains more potassium and protein than both brown and white rice varieties. Alongside proteins and essential fats, complex carbohydrates are a great addition to broths as they help to keep you fuller for longer due to their fibre, mineral and antioxidant content. My family and I have long enjoyed bone broth as part of a healthy diet. In south Asian culture it is known as ‘yahni’ and is consumed for it’s health protecting and healing benefits as mentioned above. For this recipe I have my wonderful mother to thank for passing down her culinary traditions to me. Until my next blog keep warm, nourished and happy Stocking ! This is an all-in-one recipe that makes a delicious stock, adding good colour, great flavour and is a complete meal in itself. Enjoy ! • 2 carrots / 2 celery stalks – all chopped. Feel free to add your own choice of vegetables – courgettes, turnips and leeks work equally well. • 1 red chilli finely chopped and fresh coriander to garnish. 1. Place the meaty bones in the pan and brown well for around 5-10 minutes. 2. Add all the remaining ingredients in a large deep pan or slow cooker. 3. Bring the stock to a boil, a large amount of scum will come to the top, remove this then reduce the heat, cover with a lid and simmer. 4. Allow your stock to cook for at least 1-2 hours (cook longer for a richer and more flavoursome stock). 5. You now have a delicious meat bone broth. Before serving, garnish with some chopped chilli and coriander. * For a soup and casserole base, remove the meaty bones and keep aside. Strain the remaining ingredients through a fine sieve into a bowl, cover and refrigerate. Once cooled, the broth will have a jelly-like consistency. I usually divide it into containers at this point and keep what I need in the fridge for a clear nourishing warm drink and freeze the rest to be used as a base for soups and casseroles. It will store in the fridge for about 5 days and freeze for 1-2 months.